This is one of my favorite wedding details shots. 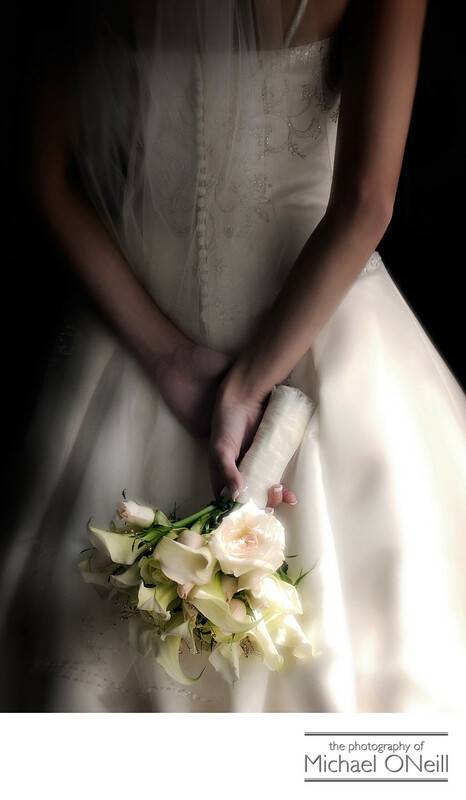 It is pure simplicity, the bride casually holding her beautiful floral bouquet delicately behind her back. A lot of post processing went into the image to give it the almost painted look that it has. This image was simply titled "Delicate Details" when I entered it into various professional photography competitions. It won awards from the local level all the way up to the international level, garnering a silver Accolade of Excellence at the annual Wedding and Portrait Photographers International (WPPI) Print, Album and Filmmaking competition.This photograph was taken at the bride’s home as she and her bridesmaids were preparing for the wedding day ahead. I love taking photographs that show all the little design elements of a bride’s wedding dress and I always try to come up with creative new ways to do that in an artistic fashion. Wedding photography is not just about the formal portraits. I try to capture all the little details that my brides and grooms have put so much thought into: Invitations, rings, flowers, shoes, favors, linens, chair covers, lighting, centerpieces, menus, signs, decorations, food displays, cakes, cake toppers, etc, etc.This couple’s wedding reception was held at one of Long Island’s premier catering venues, Oheka Castle in Huntington, NY. If you are planning a wedding at Oheka Castle, The Glen Cove Mansion, The Royalton at Roslyn Country Club, The deSeversky Mansion and conference center; or any other of New York’s Gold Coast Mansions, give me a call. I would love to talk with you about all of your dreams, plans and wishes for the big day.